Gateway Technical College will once again spotlight the environment with its annual Celebrate Earth Day, featuring fun, hands-on activities for all ages to learn how to be stewards of the environment. Celebrate Earth Day will be held 10 a.m. to 2 p.m. April 13 on Gateway’s Kenosha Campus, 3520-30th Ave. and Gateway’s Elkhorn Campus, 400 County Road H, Elkhorn. This year marks the 12th anniversary of the annual event in Kenosha which has drawn thousands over the years. 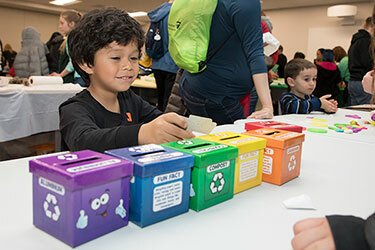 “We’re excited to offer a wide range of activities, displays and information for adults and children at Celebrate Earth Day,” said Abbie Ford, Gateway manager, community relations and communications. The Kenosha event will continue with its popular children’s climbing activity – weather permitting – directed by Aaron Schauer, Gateway’s program director for Arboriculture/Urban Forestry program. The event features many earth-friendly activities, informational booths and children’s crafts across the campus. For a full guide to all activities for the day, please go to www.gtc.edu/earthday. The event is free and open to the public. Prior to the general event, there will be a Pike Creek cleanup on the campus from 8:45 a.m. to 10 a.m. Those interested should meet at the Pike Creek Horticulture Center. A few of the many the events and features on the Kenosha Campus include. Children’s activities. Many children’s activities will be held at the event, including in the Technical Building, Center for Sustainable Living and the Pike Creek Horticulture Center. Horse and carriage rides. Sign-up is necessary for the limited number of slots available. Truck cab rides for children. Informational booths. Environmentally-focused businesses and groups will be on hand for a number of areas, including Monarch butterfly preservation, household item repurposing and reusing and many sustainable-related businesses. Oak tree planting. There will be oak trees planted from noon to 1 p.m. on the trail behind the Center for Sustainable Living. Electronics, computers, printers, VCR and DVD players. In addition, the Gateway alumni breakfast will be held 10 a.m. to 11:30 a.m. in room T-130. Organizers are encouraging alumni to stop by to say hello and learn about Gateway's rapidly expanding Alumni Association along with breakfast. A drawing will be held at 11 a.m. for a horse and wagon ride. There will be a White River trail cleanup near the campus from 9 a.m. to 10:30 a.m. Park in the southeast lot of the campus and walk to the nearby trail. Workshops such as chicken raising advice, bees and wind chime making. Green/farmers market with items such as plants, apple cider, apple sauce, kettle popcorn, naturally made beauty products, artwork and other assorted products. Children’s activities such as the Kohl’s Wildlife Theater, crafts, a petting zoo. Electronics, computers, printers, athletic shoes, prescription eye glasses, VCR and DVD players. For more information on the events at both campuses, please see www.gtc.edu/earthday or contact Abbie Ford, (262) 564-2936.